The baby's skin is usually thinner, fragile, sensitive and dry till the first few months. You need to be very careful while using any skin care products (even if the product is especially for babies). • Maintaining hygiene is of utmost importance. • Use good quality skin care products. 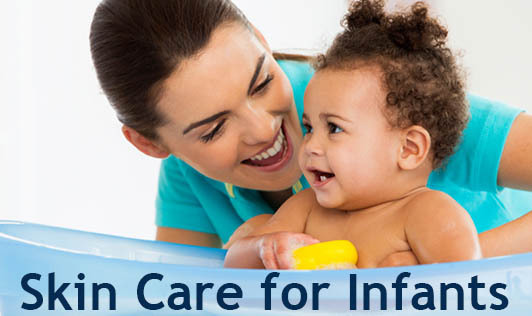 • Do not rub the baby's skin after giving a bath; gently pat dry and apply lotion. • Use soft cotton clothes. • Check if the baby is allergic to wool. • Use good quality diapers. • Keep the area airy for some time after removing the diaper. • Change the diaper immediately if it gets wet. • Keep the baby's nails clean. • Use gentle soaps and detergents for washing the baby's clothes. Consult with a Paediatrician and/or a Dermatologist for any kind of skin problems which need medical attention.